The Green Dawgs Program at the University of Washington encourages student groups to make their meetings, events, and member practices more sustainable. The program provides a framework for self-evaluation as well as resources to help student groups implement sustainable practices within their clubs. 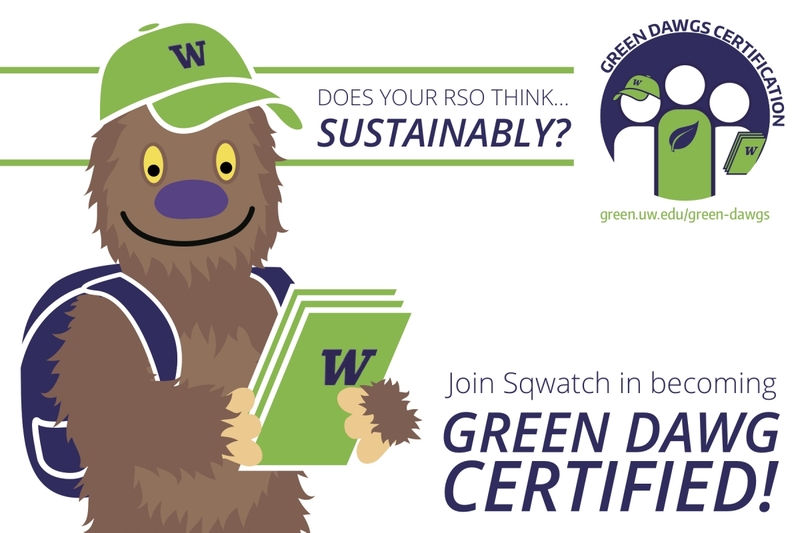 Anyone from an official UW student group can apply to receive a Green Dawg Certification, provided they or a member of the club knowingly volunteer to serve as that club’s Green Dawg Representative. Our brief online survey allows groups to recognize what steps their club is already taking to be green, and areas where there is room for improvement. Qualifying groups will be recognized at different levels of certification based on the criteria they meet. The certification is based on club practices in action areas such as energy conservation, green meetings, paper conservation, waste diversion, transportation, and more. All practices encouraged by the program are in alignment with strategies laid out in the UW Climate Action Plan, and with the intent to enhance campus ability to fulfill the goals outlined in the plan. How does a group apply for Certification? To participate, a representative from the applying UW student group should be selected as the designated point of contact, and should complete the online application form. Once the form is filled out, you will receive an email from us within a few days with more information as well as sustainability resources available to you. An intern with UW Sustainability initiated the program, bringing together staff and students who had expertise in different aspects of sustainability or student life affairs (see below). The initiating intern developed framework and criteria for the program by writing an intensive project proposal outlining strategies, goals and more. Staff members of UW Sustainability provided resources and expertise they had gathered from UW Sustainability's established Green Certification programs, and the Student Activities Office provided guidance on how best to engage student groups. After the UW Sustainability Director approved the project proposal for a pilot year, the student interns worked on developing informational materials to market the program to the student body. By working with UW sustainability staff members, and student groups life EcoReps and CSF, the Green Dawgs team was able to assemble resources to implement the pilot program. The focus of the team’s research was accessible sustainability, that is, the way that both individual students and clubs could participate in sustainable action easily and within their day to day lives. The Green Dawgs Pilot ended up being a large success, with 28 of the total 43 certified groups coming from fields without an “inherent” connection to sustainability. The fields of interest that the program reached are comprised of, but not limited to, the following: culinary arts, Greek Life, video-gaming, athletics, volunteering, comedy, radio communications, cultural awareness, personal-health, fandoms (community groups comprised of those who avidly follow particular movies, TV shows, videogames, or popular figures), and technical studies (such as information management or paper development) topics. In short, 67% of the groups that the program connected with had nothing to do with sustainability before participating in the certification; each of these groups now has a starting point to becoming more sustainable in their practices, and realizing the value of the sustainable mindset. The program has been approved to run for another year, and will be handled by UW Sustainability's green certification specialist and interns. Green Dawgs is also currently looking for volunteers to help reach a larger range of student groups. If you are interested in learning more about or participating in the Green Dawgs Program, please email Toren Elste at tee10 uw.edu for more details. Why is the Green Dawg Program Important? Though offices, labs, residence halls and public buildings can be certified green, there is no defined way to certify the practices of individuals or a group. Being that a large part of a sustainable campus has to do with the actions of staff, faculty and students it is important that there is an accessible ways for students to learn about sustainability and be recognized for it. On the Green Dawgs Team, we believe that the future of sustainability on campus, and around the world, lies within the potential of students to mobilize resources, expertise, information and concrete action to protect the nature and society from environmental degradation. UW Sustainability would like to extend a thanks to all who helped to make the Green Dawgs Certification Program as successful as it was throughout its pilot year. Below is a list of contributers, their respective organizations, as well as the way in which they aided the program.